June is a weird month on the racing calendar. The spring classics are already in the history books, the Giro d’Italia has just ended, and the Tour de France is a month away. There’s a sense of anticipation building of bigger things to come, but there’s also a bit of a mid-season lull. No one’s really on peak form. Some riders are coming up, others are tailing off a heavy schedule. And smack dab right in the middle is the eight-day Critérium du Dauphiné. Always promoted as a preview of what lies in store in July’s Tour de France, the Dauphiné rarely lives up to the hype. More than a few riders have gone on to win the Tour following success in the Dauphiné — the last to do that was Chris Froome (Sky) in 2013 — but the Dauphiné usually follows one of these patterns: an up-and-coming Tour contender who wants to impose his will early in career as a legitimate yellow jersey winner, i.e., Froome in 2013; or a rider who will play a secondary role in the GC fight in July delivers a big win, such as Alejandro Valverde (Movistar), who’s won twice, but has never reached the Tour podium. This year’s Dauphiné route features no individual time trials (though it does include a team time trial) and is heavy on the climbs, with three summit finishes packed into the final days, so the winner should be a pure climber. And with this summer’s Tour de France looking very climb-heavy, the race is at least serving up a July preview of sorts. Stage 5 traces the same exact route featured in next month’s Tour stage 17, and heavy climbing days in stage 5, 7, and 8 should crown the overall winner. Now it’s up to the peloton to decide how to race it. Long seen as a measuring stick of success in the Tour de France, several top contenders for July’s big prize will be revving up their engines at the eight-day Dauphiné. The 67th Dauphiné sees more than a few big names easing back into competition following extended breaks after the spring classics. Two-time winner Valverde, Tejay van Garderen (BMC Racing), and Joaquim Rodríguez (Katusha) are all toeing up to the line for the first time since the Ardennes classics. Froome and Vincenzo Nibali (Astana), two of the “Fab Four,” will be the headline names for this year’s Dauphiné. Alberto Contador (Tinkoff-Saxo) is taking a well-deserved rest following his Giro win, while Nairo Quintana (Movistar) remains in Colombia, and neither will race again until the Route du Sud in southern France later this month. Nibali, meanwhile, will be spinning on French roads for the first time since winning the Tour last summer. Success at the Dauphiné doesn’t always foreshadow Tour success. Last year, Andrew Talansky (Cannondale-Garmin) beat Contador in a fantastic, final-day tactical coup, yet neither of them managed to finish the 2014 Tour. In sharp contrast, Nibali rode discreetly to seventh overall at the Dauphiné, only to steamroll across France a month later to claim Italy’s first maillot jaune since Marco Pantani in 1998. Behind the GC contenders, several interesting riders will also be racing this week. Tony Martin (Etixx-Quick-Step) lines up despite the absence of an individual time trial. Rohan Dennis (BMC) and Simon Gerrans (Orica-GreenEdge) will both be looking for stage wins. Nacer Bouhanni (Cofidis) will be the fast man for the sprints, with Tyler Farrar (MTN-Qhubeka), Rui Costa (Lampre-Merida), Tony Gallopin (Lotto-Soudal), and George Bennett (LottoNL-Jumbo) all in for the kicks. Joining Talansky and Alex Howes (Cannondale) from the United States are van Garderen and Joey Rosskopf (BMC), recently crowned U.S. champion Matthew Busche (Trek Factory Racing), Ian Boswell (Sky), and Lawson Craddock, Chad Haga and Caleb Fairly (Giant-Alpecin), the last two who recently completed the Giro. Traditionally held over the French Alps, the course stays close to its roots in 2015, with a few twists. This year, there is no opening prologue or individual time trial. Instead, a 24.5-kilometer team time trial in stage 3 and four mountaintop finales will crown the eventual winner. Stage 1, held over a circuit course around Albertville, features a tricky loop that could be hard to control, but a bunch sprint is likely in the cards. The sprinters will likely get another chance in stage 2, though wind is always a factor in the region. The TTT returns to the Dauphiné for the first time since 1980, and the rolling, 24.5km course in stage 3 serves as a preview of what the teams will face in Plumelec in the Tour later this summer. Watch for BMC and Etixx to try to run away with the stage win. A long transition stage into Sisteron could see a breakaway stay clear, but with the GC still up for grabs, the peloton won’t give any groups a lot of rope in the long, 228km stage. Things get interesting in stage 5, with a route that is identical to what the Tour will trace in stage 17 in July, climbing the brutal Allos climb before tackling the Pra-Loup summit, where Bernard Thevenet beat back Eddy Merckx some 40 years ago. Friday’s stage 6 dips into the Vercours region, with a punchy finale that will provide a taste of what lies ahead for the weekend. Five climbs are packed into the short, explosive, 155km stage 7 ending at Saint-Gervais-les-Bains, just the type of finale favoring the likes of Rodríguez or Valverde. On the final day, the GC will be knotted up in another vertiginous climbing stage to Modane Valfréjus. Now in its 67th edition, the Dauphiné was born in 1947. In the wake of World War II, a regional newspaper decided to create a stage race across the Alps, calling it the Dauphiné Libéré — the same name as the paper. In 2010, Tour de France owners ASO took over the race, renaming it the Critérium du Dauphiné. The race has been won by all four five-time Tour de France winners (Lance Armstrong as well, if you want to count him), and most of cycling’s biggest names have won across the Alps. Five Americans have won the race, with Greg LeMond capturing one his first major European wins in 1983. Tyler Hamilton won in 2000, Armstrong had wins in 2002 and 2003 erased from the record books, with Levi Leipheimer winning in 2006. Talansky took an emotional victory last year in a brilliant tactical coup in what’s his biggest European result to date. Froome is a favorite in any stage race he starts. A winner in 2013, Froome looked to be in the driver’s seat last year, winning an early stage to don the leader’s jersey, but was impacted by a crash that foreshadowed what would happen in the Tour. Froome hasn’t raced since finishing third at the Tour de Romandie a month ago, and although he doesn’t have anything to prove to his teammates, you can bet he will be at the sharp end of the action. It’s hard to read how Nibali will perform. If last year and his spring so far in 2015 are any indication, the “Shark” will be saving his bites for July. Last year, he was a discreet seventh overall, leading many pundits to discount his chances for success in the Tour. Of course, Nibali barnstormed across France to win the yellow jersey when it counts, in July, so it’s unlikely Nibali will be racing to win. The French haven’t won the Dauphiné since 2007, so watch for riders such as Romain Bardet or Jean-Christophe Péraud (Ag2r La Mondiale) to be racing for the podium. The team time trial stage could weaken their chances, but this Dauphiné will be decided in the mountains. Both should be flying. Then there’s always Valverde. A two-time Dauphiné champion, he seems to win at will these days, but with the Tour and the Vuelta a España on the horizon, it’s doubtful “Balaverde” will be firing at full cylinders right now. Rodríguez will also be looking to peak during July, and could well be content with a shot at a stage victory without too much GC pressure. In contrast, Wilco Kelderman (LottoNL) is out to prove his early career results were no flukes, and hopes to improve on his fourth overall last year. It will be interesting to see how Louis Meintjes (MTN), the 23-year-old South African climbing sensation, will hold up against the big boys. 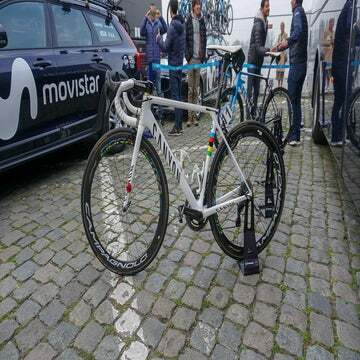 A winner of a stage and the overall at the Settimana Coppi e Bartali in March, he finished 11th at Liège-Bastogne-Liège and clearly has the engine. He will be looking to win a stage and chase the climber’s jersey, and maybe more if he finds his legs in the final string of mountain stages. Another youngster worth watching is 22-year-old Julian Alaphilippe (Etixx), who’s been one of the revelations of 2015. And the Americans? Talansky returns as defending champion, but he’s struggled with form early this season, pulling out of the Amgen Tour of California with allergy problems. Van Garderen has performed well at the Dauphiné, with a third overall in 2010, but both riders are betting on big results in July and likely won’t be on top form next week. Bauke Mollema (Trek Factory Racing) is due for a big result. He’s been making major strides since joining Trek this season, with second in the snowy Terminillo stage and second overall behind Quintana at Tirreno-Adriatico, and second in the Arrate climbing stage behind Rodríguez at the Vuelta al Pais Vasco (Tour of the Basque Country). Third overall in last year’s Tour de Suisse, Mollema will be riding hard to prove he can lead in major races, so a breakout performance could well be in the cards. This year’s climb-heavy route could tip the scales toward a pure climber. Froome will be a factor, but riders such as Meintjes or Bardet could certainly ride away with the prize.